Very vital-rich with essential amino acids, vitamins and high chlorophyll content. 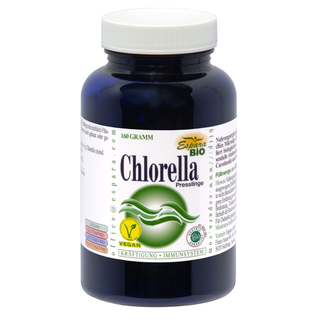 With the vital substance-rich microalga Chlorella vulgaris. From controlled organic cultivation! Chlorella contains essential amino acids, vitamins, etc. and is characterized by a particularly high chlorophyll content. Consume 3x daily 5 tablets with plenty of water. 6g of Chlorella vulgaris (at least 2.5% chlorophyll, 0.5% carotenoids).